Taipei (dpa) - A study published recently in Taiwan showed that drinking green tea is effective in preventing cancer caused by smoking. Lin Yi-hsin, a student from the Graduate School of Public Hygiene at Taiwan's Chung Shan Medical University, said many studies have shown that drinking green tea is effective in preventing cancer, but her study focused on green tea's effectiveness in preventing cancer caused by smoking. Lin recruited 500 people, including 170 lung cancer patients, for her study. "I analyzed their lifestyles and habits of smoking, eating and drinking tea," she told a news conference at her university in Taichung, central Taiwan. The study found that those who do not drink green tea are five times more likely to develop lung cancer than those who do. And those who do not drink green tea but smoke have 13 times the risk of getting the disease compared with people who drink at least one cup of green tea each day. 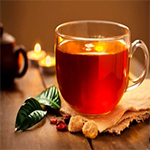 This is because tea polyphenols are an antioxidant which can inhibit the formation of lung cancer cells, she said. Professor Wong Jui-hung, who supervised Lin's research, said: "This study has shown that drinking green tea can check the growth of insulin-like growth factor, which is a hormone that stimulates the growth of cancerous cells. "Lung cancer is common in Taiwan but rare in Japan because the Japanese like to drink green tea," he said at the news conference.